Input text: a 25 feet tall and 10 feet wide and 10 feet deep wood traffic cone is -2 feet above the ground.a 22 feet tall wood staircase is -29 feet above the traffic cone.a 6 feet tall and 8 feet wide tube is 1 feet wide wood. it is -6 feet above the traffic cone. a 10 feet wide plate is 1.5 feet wide wood. it is -.1 feet above the tube. it is upside down.a window is -.1 feet behind and -5 feet above the tube. 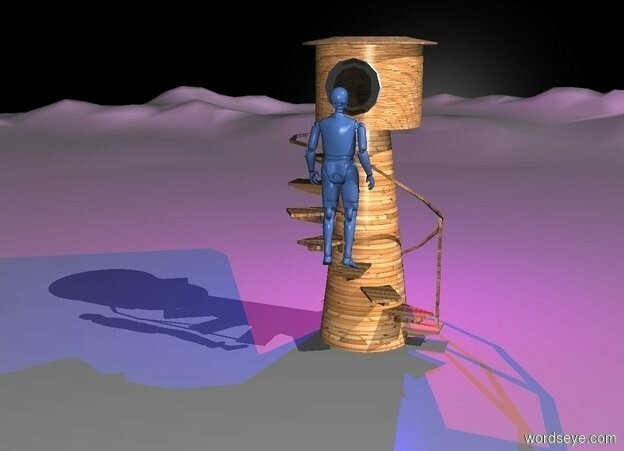 a black backdrop.a red light is in front of the tube.a 150 inch tall delft blue man is -100 inch above the staircase.the man is behind the staircase.a blue light is 150 inch in front of the window.